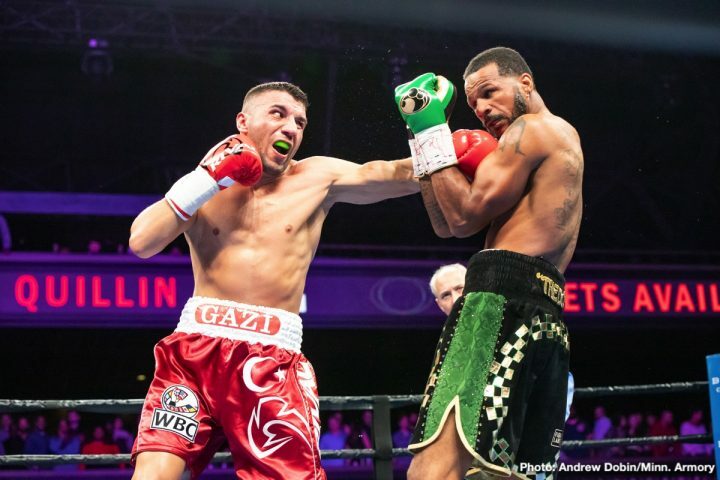 Dirrell vs Yildirim: World Boxing Council to order an immediate rematch? Avni Yildirim from Turkey arrived in Mexico City with his promoter Ahmet Oener to meet WBC President, Mauricio Sulaiman..
Yildirim fought against Anthony Direll in Minneapolis this past Saturday for The vacant WBC Super Middleweight world championship. It was a tremendous, action packed fight which resulted in technical decision due to the severe damage to Direll’s left eye which resulted from accidental headbutts during the fight. Direll was awarded a split decision victory and he conquered The WBC green and gold belt. “ I started my training camp since many months before and sacrificed very much to get to USA to win the Green and Gold belt “. “ Fight did not finish, round 10 did not finish and I lost in the scores of 2 judges because round 10 was scored for Dirrell, but round was not finished, if I win round 10 then fight was a draw”. “ I accept result , I thank you Mr President for complete explanation of rules and procedures, I don’t ask to change result of fight, I please ask for WBC to support direct rematch”. “ I respect Dirrell and I know he wants to fight me again to show in the ring who is best with final and clear ending”. The WBC has received this appeal and will proceed with the protocol as outlined by The WBC rules and regulations. Boxing » Press News » Dirrell vs Yildirim: World Boxing Council to order an immediate rematch?